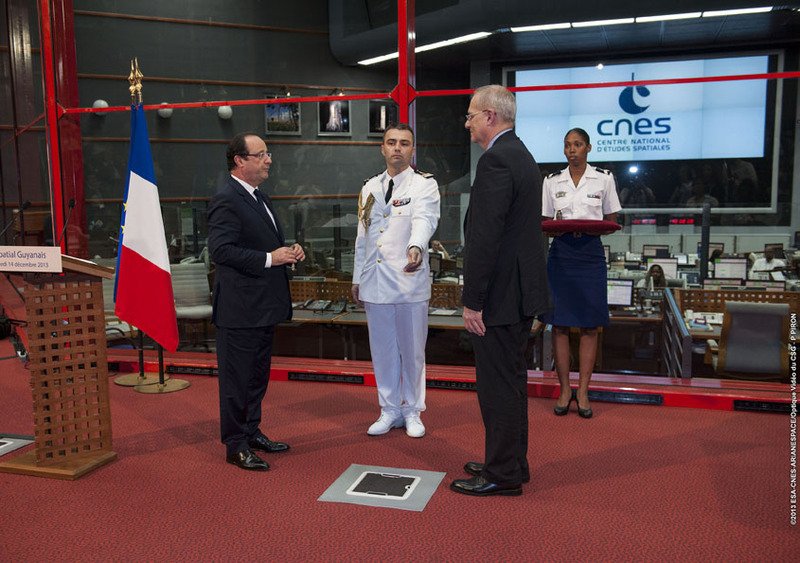 French President François Hollande was in French Guiana on Saturday 14 December to visit the facilities at the Guiana Space Centre, accompanied by CNES President Jean-Yves Le Gall. François Hollande presents CNES President Jean-Yves Le Gall with the insignia of Officer of the Légion d'Honneur. Credits: ESA/CNES/Arianespace/Optique Vidéo du CSG/P. Piron. French President François Hollande began his visit with a helicopter tour of the CNES space centre, the Montagne des Pères and its launcher tracking stations, the launch pads of the Ariane 5, Vega and Soyuz launchers, and the site earmarked for the future Ariane 6 launch complex. At the end of his flyover, President Hollande was able to see the Îles du Salut and notably the famous Devil’s Island and the house where Captain Albert Dreyfus was imprisoned, recently restored by CNES. 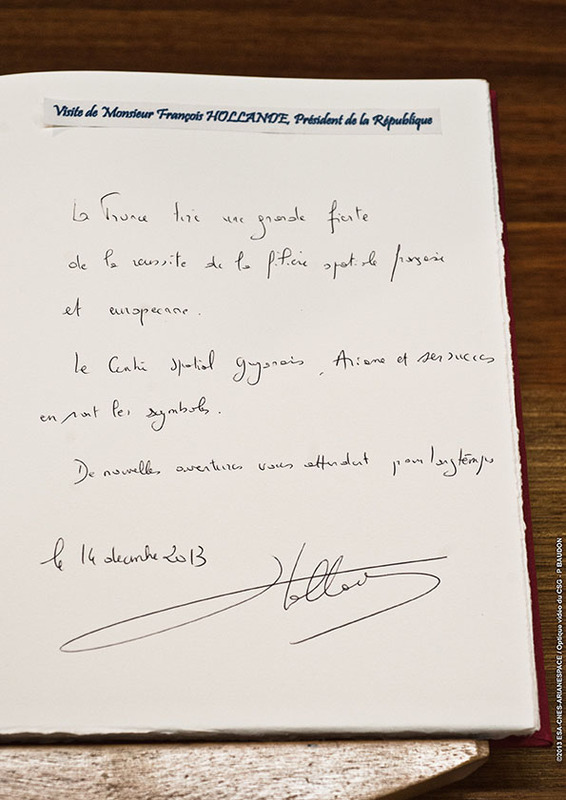 President François Hollande signs the CSG’s visitors’ book. Credits: ESA/CNES/Arianespace/Optique Vidéo du CSG/P. Piron. After the helicopter tour, President Hollande was welcomed with Jean-Yves Le Gall by CSG Director Bernard Chemoul, accompanied by Eric Spitz, the prefect of French Guiana, and elected representatives for a visit of the Jupiter control centre where he was shown a simulation of the launch of the ATV-4 by Ariane 5. He then gave a space policy speech before presenting the insignia of Officer of the Légion d'Honneur to Jean-Yves Le Gall. To conclude the President’s visit, Jean-Yves Le Gall presented him with a print of a Pléiades satellite image of his birthplace, Rouen.